If you can’t get enough of the gorgeous Batumi architecture, the Chacha Clock Tower will have you be guiled even further! 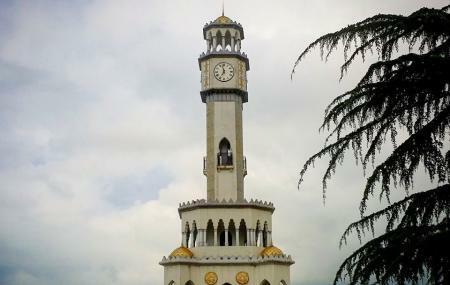 Designed by the Levantine French architect Raymond Charles Pere the Chacha Clock Tower is elaboratively decorated in an elaborate Ottoman architecture style. Go here during the night, and the light display will leave you awestruck. The lights illuminate this tower gorgeously against a backdrop of the night sky and twinkling stars. Tourists love clicking pictures of this monument post sunset! Situated centrally this Batumi attraction accommodates 4 fountains on every sides. As per folklore, previously, the tower would exude a liquid called ‘Chacha’- Georgian vodka. This is where the tower derives its name from too. However, this practice does not happen anymore. Built in 2012 with reference to a previous Batumi structure of the 20th century, the Chacha tower inclines towards the sky at a length of 25 meters. Like most other attractions, you will spot this one too, several times, on your way to other attractions of Batumi. Post sunset, the Chacha Tower makes for a great photo opportunity. How popular is Chacha Clock Tower? People normally club together Monument Ali And Nino and Miracle Park while planning their visit to Chacha Clock Tower.